Balenciaga on Billion Dollar Babes today! WinkNYC's sale section is an additional 15% off with code "S8P9X". Ends Monday, Apr 5. Not a ton left, but still some cute Geren Ford and Patterson Kincaid pieces. Groupon's deal of the day: $35 VIP tickets to the Beauty Bash at Hudson Hotel (retail $75). Two dates available: Monday, May 10 and Monday, Jun 21. Event time: 6:30-9PM. A VIP ticket to a Hudson Terrace Beauty Bash works like a gilded key to a treasure trove of tranquil treats. Traipse from station to station on this beauty train, indulging in everything the style salon has to offer. The event will be held in the second-floor salon space of Hudson Terrace, 5,000 square feet of open floor, red leather couches, and opulent crystal chandeliers. Makeup artists will clack brushes alongside hair and beauty stylists, and skin consultants from iS CLINICAL may be seen distributing free samples like a generous prince tossing gold doubloons to assembled peasant clusters. A live (not reanimated) DJ will spin tunes to warm the air follicles, and an open martini bar will shake the very souls of guests over the course of the evening. Until Friday, Apr 2, Tina Tang's initial necklaces are 50% off, making them $63. Dilly dally too long and they go up to $88. Then on Monday, Apr 5 they go back to full price. This would make a fabulous b/day present. Only available in sterling silver. Daily Candy has just introduced me to a whole new level of geekout. 3floz.com carries small sizes (and some regular sizes) of skin and hair products. PERFECT for testing out at home before committing, or, you know, traveling. I am definitely going to try some of the Philip B white truffle haircare that would a ridiculously expensive gamble if you hate it. I'm also going to stock up on some items that I get at CO Bigelow (the one on 6th Ave that never participates in F&F!) like Ted Gibson hair sheets and Dr. Hauschka nail pens. Use code "DC3FLOZ" and get 25% off your order too! Although this dreary weather is NOT putting me in the mood for spring dress shopping, TheOutnet has gotten a nice shipment in, and priced up to 70% off too! (there, did I get your attention?) 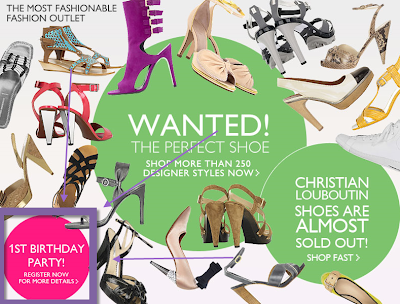 TheOutnet.com is celebrating their 1st birthday on Apr 16, and to celebrate, they are having the most ridiculous totally bonkers sale ever. Everything will be 1 USD/GBP/Euro (depending on where you live). To be invited, you need to log on to your account and RSVP. Then on Apr 16, they will email out a 'secret' link which will take you to the sale. Soooouunds good? (a la Brad Pitt in Inglourious Basterds). I should also add that each person is only allowed to purchase 1 item, so choose wisely! Oh, and RSVP-ing closes Sunday, Apr 11. 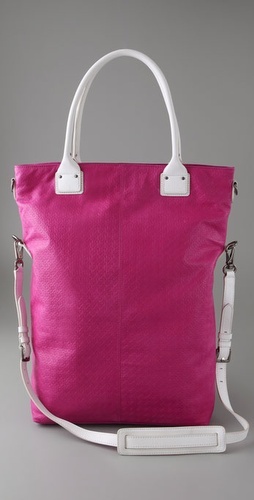 BDB has a Balenciaga sale today starting at 11AM EDT! 33-95% off items for girls and boys. Twist my arm, will ya? If you are not too fussy about your undies, you might want to check out the clearance section at HerRoom.com. There's not a whole lot, but if you have a particular brand you adore, it's worth a look. I am pretty loyal to Hanky Panky, so I'll just snap up any pair at a good price. Not tons of selection, but there are some nice finds in the Blue Bee Sale section, which is now 70% off. Just a reminder that www.ToryBurchPrivateSale.com goes live at 2PM (EDT)!! A very nice and much-appreciated commenter let me know that Caudalie (USA) is having another F&F event! Starting today, use code "BFF" to get 20% off your entire purchase. Ends Monday, Mar 29. This weekend's Shop-in: +50% off print dresses. You can look at the selection now, but the sale doesn't go live until noon EDT. Tory Burch boutiques and ToryBurch.com are doing a 50% off sale on clothing. However, on Friday, ToryBurchPrivateSale.com throws its doors open for a sale on (presumably) other things. Hopefully some bags and shoes? YOOX.com has a 10% off coupon for their SS items. Use code "SPRINGFEVER@YOOX". Ends Sunday, Mar 28. Shipping is free! Up to 60% off a good selection of denim, bags, shoes, and clothing. Late-breaking news! Today through Sunday, head to the Metropolitan Pavilion for the Hermes sample sale. Mostly accessories (scarves, ties, some bags, MAYBE jewelry) and clothing. If you need to get some new full-priced items, NM and Saks are running dueling Spend $X get a gift card for $Y promotions. 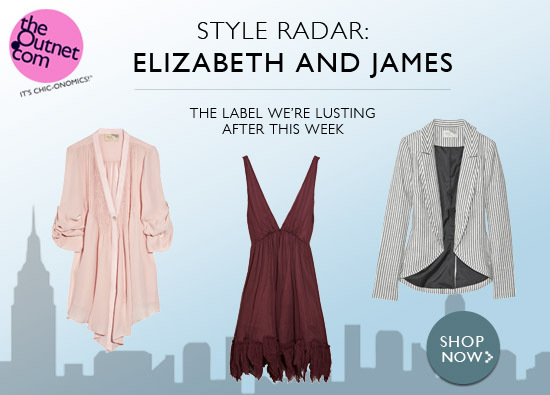 Depending on what you're buying (and whether you like Elizabeth & James or not), you'll want to do some comparison shopping. NM promo ends today, Saks' ends Sunday, Mar 28. TOMORROW!! You'll want to cancel any meetings, have your credit card on hand, and stretch your mouse clicking finger in preparation for tomorrow's HUGE Christian Louboutin sale on TheOutnet.com. Shoes are up to 65% off. There is no official start time, so I'll remind everyone again in the morning to keep checking! But you better believe I'll be there, ready to fight. It's a vicious, vicious battle where you only win if you make to the checkout stage. Items will be yanked out of your basket if you dilly dally. There will be over 100+ styles available, so make sure you know what size(s) you wear because Loubs can be all over the map. My ideal score? A pair of 120 Decolletes. A girl can dream! Bloomingdale's has started their F&F! 20% off everything except a lot of stuff (see below for exclusion list). No beauty/cosmetics. 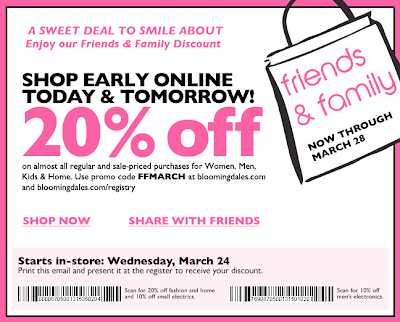 Use code "FFMARCH" to shop online or print out the email to shop in-store. Ends Sunday, Mar 28. Women's apparel: Chanel, Marc Jacobs, All Saints, UGG® Australia and The North Face®. Men's apparel: UGG® Australia, Ralph Lauren Black Label, PS Paul Smith, Turnbull & Asser, Moncler, The North Face(R), and Burberry Prorsum. Kids' apparel: UGG® Australia and The North Face®. Accessories: Chanel Handbags, Soft Leather Goods, Shoes and Sunglasses, Dior Shoes and Handbags, Fendi Handbags, Soft Leather Goods and Shoes, Salvatore Ferragamo Leased Handbags and Soft Leather Goods, Jimmy Choo Shoes and Handbags, Louis Vuitton, Agent Provocateur, UGG® Australia Shoes, The North Face® Shoes and Giuseppe Zanotti Shoes. Misc: Gift Cards, David Yurman, Cosmetics, Fragrances, Martine's Chocolates, Shop at Home Services, Rug Cleaning Services, Interior Design Special Orders and Fur Services. Louis Vuitton sale on BillionDollarBabes!! Go now! ShopBop has been kind of quiet lately, so I checked to see what was going on. Not a whole lot of new things added to the sale section, but there are some cute bags on sale right now for 30% off, including Marc Jacobs, Alexander Wang, Rebecca Minkoff, and my favorite of the bunch, the Diane von Furstenburg Carmen tote. It just looks so summery. Now $346.50 (retail $495). I'll check back on them again next week. Will have more info soon! Have a great gorgeous weekend! 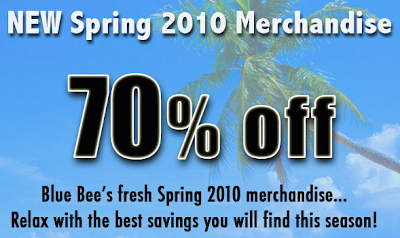 Blue Bee has marked down some new Spring merchandise by 60%. The selection isn't super robust, but they did get some new Philosophy by Alberta Feretti pieces, Creed perfume, and a nice selection of jeans under $75. Update: forgot to add, size 2 is running thin, but they are restocking, so I'd go now if you have time to dig (or wear size 1,3, or 4), or show up first thing tomorrow morning. All I can say is, OMG. This sale is all out insanity and awesome bundled into one. There is SO MUCH merchandise for women, a pretty good selection for men, and 2 racks of clothes for children. What you'll find for women: tanks $18 (although the selection is VERY slim. I didn't even think to head there first, and it was ravaged), t-shirts $20-39, long sleeve t-shirts $25-39, long sleeve tops (a lot of overstock FW) $25-39, sweaters $59-129, those fleece jackets and hoodie pullovers from FW $59-129, lounge pants $49-59, canvas/cotton pants $59, wool wide-leg trousers $59, lounge shorts $59, button down long-sleeve shirts $59, maxi dresses $59+, sweaters $129, long tunics $59-129, overcoats $129+ ... basically, everything in the warehouse. Although I didn't thoroughly browse the mens section, which was really calm compared to the chaos in womens, the selection looked pretty good, and there were a lot of men in the check-out line, which is a solid testament to the selection. Original posting here, but it's in Chelsea Market (which is adding an Anthropologie!). Go go go. This weekend's Shop-In: an additional 40% off accessories from Lanvin, Thakoon, Proenza Schouler and Kenneth Jay Lane. You can browse now, but the +40% discount isn't live until noon EST. You'll see it upon checkout. Lord & Taylor is going gangbusters on a lot of categories (Ladie's sweaters, coats, suits, denim, Fine Jewelry, [select] Handbags, Mens jackets, Kids dresses) with a lot of good discounts-- 20-50% off during their Signature Sale. Select 'Fine Jewelry' is 50% off PLUS they are doing a new 20% off code (use code "SALE"). This means a 16" Akoya pearl necklace which is normally $500 is now $200. They also have diamond studs on sale! One carat (total weight) princess 18K white gold studs can be yours for $2,120 (retail $5,300). There's a lot of good stuff there, like some gorgeous super bling cocktail rings, and if you are a jewelry freak like me, you need to have a look! Sale ends Monday, Mar 29. Update: I would also note that classes are limited to 4 women per session, so I wouldn't delay on booking a class! We're all curious as to how hard it is to pole dance, but if you want to put $20 towards finding out, get today today's Groupon deal: $20 for One Introductory Pole-Dance Workout at Sheila Kelley S Factor ($40 Value). Fine Print: gift certificate must be used by 9/19/2010 at their following locations: 235 W 23rd St, 226 E 54th St, or 147 W 24th St.
Chantelle is the practical La Perla. Pretty, but not ridiculous. If you have a weakness for French lingerie, you should check out the goods at longstanding sample sale spot 260 5th Ave. Prices are over 50% off, but all sales are final. Familiarize yourself with price points at HerRoom.com or BareNecessities.com, (who is actually having a 25% off sale for women and a buy-one-get-one 50% off sale for men). When you're Facebooked, you're practically family. In fact, it might be better than family because even I deny my uncles and aunts from being my friend. Haha. Anyway, Juicy Couture is having their F&F event now through this weekend. In-stores only, so print the coupon and go! It works on sale items too. Ends Sunday, Mar 21. Since I'm slotted to be in two weddings next spring, I'm keeping an eye on bridesmaid dress sales. J.Crew is actually having an online dress sale right now-- 20% off almost all their dresses, including bridesmaid ones! (but not wedding gowns) Ends Friday, Mar 19. Just in time for spring cleaning! If you have any unwanted designer, RTW, or shoes that need to find a new home, fill a bag and make like Santa this weekend. Or, just pick a charity for your F&F discount. During her "Bring Back, Get Rewarded!" weekend, donate any gently worn designer or ready-to-wear piece to a boutique and get 30% off your entire full-price SS 2010 purchase. All donations will go to Housing Works. 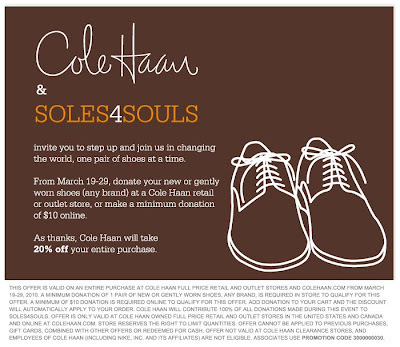 Cole Haan will give you 20% off your entire purchase when you donate your new/gently worn shoes (any brand!) at a Cole Haan retail or outlet store or make a minimum donation of $10 online. The receiving charity, Soles4Souls, distributes donated shoes to people in need all over the world. To date, the company has given away more than 7 million pairs, and is currently donating one pair every 9 seconds. During Gap/BR's F&F weekend, you get to pick a charity and get 30% off! (even the outlet stores) Your charity gets 5% of your proceeds. If you're already registered, you can pick your charity here or print my coupon (below). In-store only. While you're waiting for TheOutnet sale to start, if you feel compelled to own a pair of denim leggings, checkout ThePrive.com. They have the J Brand 901 leggings in Olympia wash for $79 (retail $139). Update: Damn girls, I get out of my meeting and there is NOTHING LEFT. It's like tumbleweeds in there!! Good job! I found a gorgeous pair of Brian Atwood boots which I found at the beginning of my meeting, but 2 minutes later they were gone!! I am super upset that I have a meeting after lunch!! 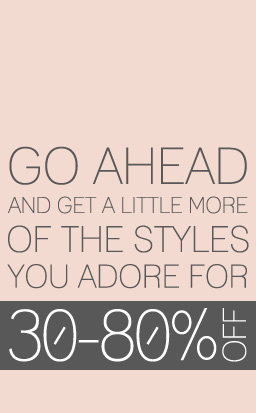 Starting at 1PM EDT (1 hr 40 min from now), TheOutnet is putting up tons of goodies at 80-85% off. And you know they have good stuff. To save time during checkout, make sure you are registered! Ends Tuesday, Mar 23. Oh YEAH. My fav semi-permanent sample saler, Prive, has a truckload of James Perse for this weekend (for men, women and kids)!! After wearing around those fleece lounge pants I got from the Nordstrom Rack in Austin, I am definitely open to getting more. I can't wait! Per Facebook, Tibi is having an in-store sale on resort wear. Up to 50% off. Oops, almost forgot to post this one... Another one-day sale. BillionDollarBabes is having a pretty good sale today: 7 for all Mankind denim for men and women (and kids) and also Kenneth Jay Lane jewelry. Make sure you get your $50 massage or facial before they get booked up! Some participants of previous years don't look like they are doing it this yr :( boo! Check www.spaweek.com to see everything available. Appointments are for Monday, Apr 12 - Sunday, Apr 18. I've booked a microderm and a IPL session, which I've never done before. I hope it doesn't hurt! Also next week, inject your wardrobe with some bright color and bold styling via the Issey Miyake sample sale. Up to 80% off mens and womens plus HaaT, Pleats Please, Final Home, and Cauliflower collections. One day only. Cash or CC. All sales final. No returns or exchanges. It's time to bone up your summer clutch collection. Many thanks to Donna for sending this in! Cash or CC (V, MC, Amex, Discover). No checks. Lord & Taylor has another 20% off code ready to go. Use code "SIMPLE" to shop online, or print out the coupon (PDF) to shop in-stores. Ends Monday, Mar 15, and the exclusions are hidden below. Perfect timing for wedding/bridesmaid dress shopping, although it is a bummer that BCBG is excluded. Some pretty awesome finds: this Kenneth Jay Lane multi-strand lucite necklace which is now $28.15 (retail $88). And some faux Yurman bracelets now $39.99 (retail $100). REGULAR-PRICE ITEMS from Allen Edmonds, Aquatalia, BCBG/BCBG MaxAzria, Cole Haan, Dooney & Bourke, Ecco, Frye, Hudson Jeans, Jeffrey Campbell, JPK Paris, Kors Michael Kors shoes, Lacoste, LeSportsac, Marc by Marc Jacobs shoes, Merrell, Michael Michael Kors shoes & handbags, Not Your Daughter’s Jeans, Seven for all Mankind, Tumi, Twelfth Street by Cynthia Vincent shoes, Ugg & Wacoal; men’s Tommy Bahama; kids’ Guess and boys’ dresswear. SALE-PRICED ITEMS from Allen Edmonds, Aquatalia, BCBG/BCBG MaxAzria, Cole Haan, Dooney & Bourke, Ecco, Frye, Jeffrey Campbell, JPK Paris, Kors Michael Kors shoes, LeSportsac, Marc by Marc Jacobs shoes, Merrell, Michael Michael Kors shoes & handbags, Tumi, Twelfth Street by Cynthia Vincent shoes & Ugg; men’s Lacoste shoes; kids’ Guess and boys’ dresswear. DEPARTMENTS: Cosmetics, fragrances, beauty accessories; all Fine Watches, diamond solitaire rings, designer jewelry & special event promotions in Fine Jewelry; fashion watches; Smart Value items & gift cards. Sorry I haven't kept my list updated with the flash sales. It's been a hectic two weeks with busy work, 5 days in Austin, and 2 in Philadelphia. However, tomorrow (Wednesday) and Thursday you need to pay attention to RueLaLa. They are doing 'Final Act' sales, which is always a frenzied fun time. And if for whatever reason you aren't registered, join now. The Exclusif Showroom will have spring and transitional RTW collections in all sizes from Ungaro, Versace, Galliano, Ferre, Dolce & Gabanna, Just Cavalli by Roberto Cavalli, among others. They will also have Dior, YSL, and Gucci sunglasses. Up to 80% off, so if you feel like an adventure, this might be a good place to visit! Check out TheOutnet.com's new stock of Valentino and Valentino Roma. Visit Inhabit's "Spring Break Sale" for a pretty decent selection of cashmere blend tops. Reverse-Reverse.com, I believe a baby website of RevolveClothing.com, is having a sale on LNA (50% off) and Kyumi (60+% off). New merchandise (mostly winter) up to 70% off at ShopBop.com. Shipping is free. FamousFashions.com is 50% off with code "FINAL50". Be aware that all purchases using this code are final. No returns at all. It won't work on the one-of-a-kind or $10 items. No expiration date given, but I doubt it'll last forever. We already knew this was coming, but it's always lovely to be reminded. Decadestwo will be holding court at Kiki de Montparnasse starting next Thursday. Look forward to Chanel RTW and accessories and Alexander McQueen, among others. There's also a little footnote that says on Sunday, all styles of shoes in the shoe salon are $150 and under! Officially starting Wednesday Filene's Basements will host their Spring Designer Event, which means inventories of names we definitely want to see like Gucci, Dolce & Gabbana, McQueen, Armani, Valentino, etc. Prices will range between 30-80% off. However, you might want to get a jump on the crowds and pop in Tuesday night for their 'preview'. 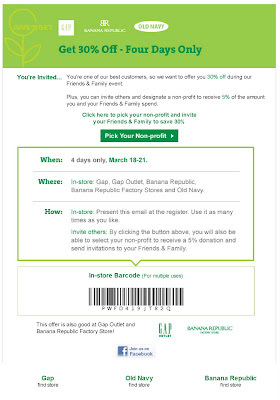 Print this coupon for an extra 10% off too (valid Wednesday, Mar 10 - Sunday, Mar 14). 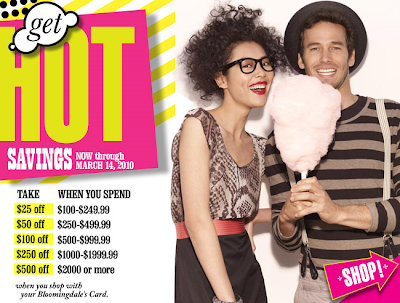 If you have a Bloomingdale's credit card, you could get a nice little discount for your shopping now through Sunday, Mar 14. Lots of exclusions, though. Time to get some new undies or bras or summer nighties? Or boxers for the boys? They also now carry Spanx swimwear. Click through this link (or the image below) to get 10% off your order (no min) at BareNecessities.com. Free shipping with $50+. Ends Monday, Mar 15. The Wonder Woman section on YOOX.com is an additional 15% off. That section includes a fabulous selection of Dior shoes, Miu Miu shoes, Prada shoes, and Cavalli tops, Marni tops, etc. Use code "WOMAN@YOOX". Ends Monday, Mar 8. Shipping is free too. Escada will be having a sample sale with prices up to 75% off starting this weekend. Cash or CC (V, MC, Amex, Disc) only. No checks. All sales final. No children under 12. No strollers. The real deal. Hopefully they bring the inventory like they have in sales past which would be tons and tons! Update: The link is live, but the additional discounting isn't live yet (you'll see the additional 50% off in the final checkout stages). So window shop away! Starting at noon, TheOutnet.com will have some last-call fall pieces at an additional 50% off. A couple weeks ago I scored a Philosophy by Alberta Ferretti dress for $110 during their 50% off weekend sale, so I will definitely be checking this out! I'm a big fan of Nordstrom Rack, and over the weekend when I was in Austin, I made sure to squeeze in a visit. I wasn't disappointed. They had Cosabella bras for $24, Hanky Panky undies for $12, and a rack of James Perse! I scored a black scoop-neck t-shirt for $25 and grey fleece pants for $50. I also found these Burberry platform peep-toe heels which were 50% off $399 (retail $795). So if you're heading north, or visiting the Container Store, you should pop in to see what you can score. Red Envelope is having a Spring sale, having marked some things down 50%. One thing that caught my eye: this Tourmaline Cluster necklace which is now $50 (retail $295). It comes with a descriptive giftcard which will absolutely make the receiver believe you spent way more than $50 on it. Or, for the moms out there, there's a gorgeous St. Kilda mother's necklace for $65 (retail $295). Plus you can use code "REDTIER" and get 10% off all orders or 15% off $80+ or 20% off $125+. I'm actually waiting on a pair of titanium Chanel eyeglasses to come in. When I ordered them two weeks ago, I had a lot of fun looking through all the frame styles at the Lenscrafters Optique near my house. I was surprised to learn that they can put prescription lenses in the designer sunglasses frames! They say so long as the lens required isn't super curved (like a wrap-around), they can do Chanel frames, Ray Ban frames, Prada frames, etc. Pretty cool since I can't go outside in the bright sun without sunglasses (and therefore only wear contacts during the summer). If you are interested in Chanel frames, you have to go to an Optique location. Otherwise most other locations carry Prada, Ray-Ban, D&G, and even Tiffany & Co (don't get me started on the "Tiffany blue" frames). The 50% off discount covers regular lenses, bi-focals (no lines) and prescription sun, with frame purchase. Ends Saturday, Apr 3. 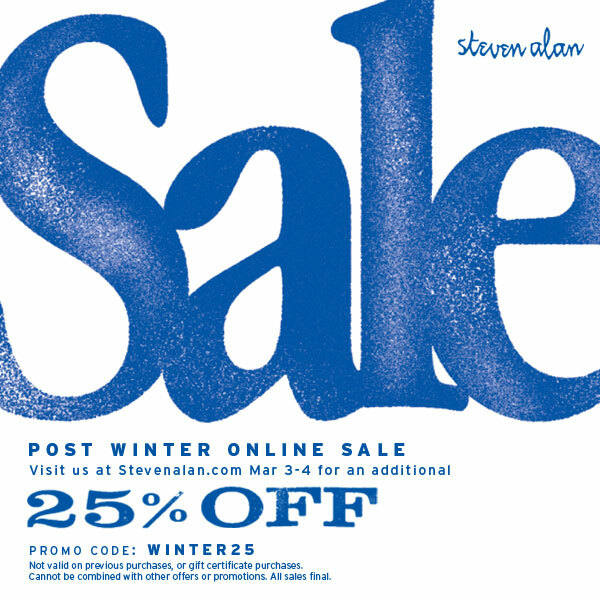 Today and tomorrow only, use code "WINTER25" to take an additional 25% off Steven Alan's winter sale merchandise. Mintbox has a great promo for trendy East Village boutique Cry Wolf, which carries great brands like 80%20, Acne, Chronicles of Never, Cutler and Gross, Fremont, Generic Surplus, Nudie Jeans, s2vs, Surface to Air, and Vanishing Elephant (among others). Log into your Mintbox account to print a coupon good for 30% off all new merchandise and 20% off sale, plus 10% cashback. Or, you can shop online and get a flat 20% off with code "PROMOWOLF". L&T has a 15% off code that can be used on the new stuff! Use code "SPRING" through Tuesday, Mar 9. Online only. Update: Free shipping now through Monday, Mar 15. Not sure how much there is left, but YOOX.com has extended their end of winter sale with prices up to 80% off. 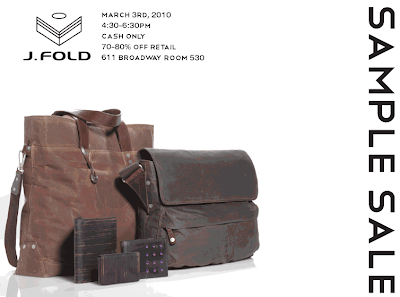 Funky mens bags and wallets will be available tomorrow for a short period of time at J.Fold's showroom. Cash only! It's that time of the year... Wink's annual warehouse sale is here again. Make a trip to Lincoln Center to see what you can grab at up to 80% off. Shop online with code "WRHS10" and get 15% off through Monday, Mar 8. Tobi.com is having a nice sale on mens and womens. Their email links don't work, so you'll need to go to the main page and head to the sales sections.